Liverpool defender Virgil van Dijk is the clear favourite to be named PFA Player of the Year this season, according to bookies Ladbrokes. 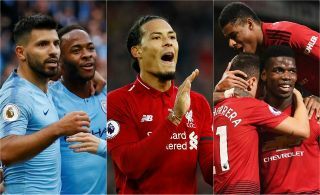 The Reds ace has been immense for Jurgen Klopp’s side this term as they still look to be in with a strong shout of winning the Premier League title despite a recent rough patch. Unsurprisingly, Liverpool and Manchester City players dominate the top 15 list shown to us by Ladbrokes, with just one player each from Manchester United, Arsenal and Chelsea, showing just how far the might have fallen this term. Here’s a list of the 15 favourites, with Van Dijk currently 2/5 to take the prize – a superb achievement for a centre-back if he does do it, with defenders rarely being rated above attackers when it comes to individual honours. Still, with City having a game in hand over their rivals, there’s every chance the likes of Sergio Aguero and Raheem Sterling (6/1 and 8/1, respectively) could be worth a shout too if their late-season form proves influential in deciding the destiny of the Premier League crown. There was even some talk of Tottenham’s Son Heung-min being a contender after a purple patch earlier this season, though he’s just 50/1 and the in-form Sadio Mane at 20/1 might be more worth a flutter as an outsider to take the prize.